"This recipe came from a dear friend of mine. It is an unbelievably delicious fudge! 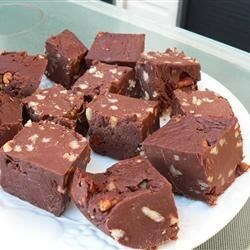 This fudge has been a hit with all who have tried it. Don't let them know the ingredients until they have tasted it; they still won't believe it has cheese in it. Also, it is easier to make if the recipe is halved. Pecans can be substituted for walnuts. " Melt cheese and butter together in a nonstick saucepan; stir until smooth. Keep this mixture over a low heat. In a mixing bowl, sift confectioners' sugar and cocoa together until thoroughly mixed and no lumps remain. Combine the sugar mixture with the melted butter and cheese. Stir until very smooth. Stir in nuts and vanilla. Press mixture into 2 lightly sprayed or buttered 9x13 inch pans; let cool until firm. Cut into small squares. This fudge can be frozen. This rich, chocolaty fudge is so easy to make. I forgot in my earlier review to state you do NOT have to cook this fudge -- just mix it. Also, use no-salt butter. This didn't turn out for me.The velvita cheese and the butter wouldn't mix.Made a big mess and wasted a lot of stuff. Greasing the pan is not necessary. Like the original recipe says: Do NOT tell people the "secret" ingredient until AFTER they have tasted it. Trust me! This is an awesome recipe!! Thanks!